There are many things to consider regarding the use of vapor barriers. Installing a vapor barrier in your basement can help protect your home from moisture, mold or damp conditions. If you are finishing basement walls, or adding a false wall to an existing basement, installing a vapor barrier before finishing the walls can be a wise move. While vapor barriers come in multiple types, most install the same way. Be sure to install the vapor barrier that is recommended for your climate, and to install it prior to any finishing work done in the room. Inspect the walls to be protected. Make sure they are clean, dry and have no cracks or visible damage. 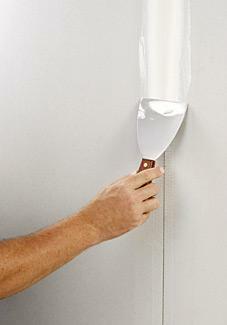 Run a bead of silicone caulk around any window or door frames and into any gaps in the walls. Spread out the vapor barrier onto the walls. Staple or nail the top of each sheet every 2-feet to ensure proper placement and protection. Allow each sheet to extend at least 12-inches past the foot of the wall out onto the floor. Double up the edges of each sheet so they overlap by at least 4-inches. Secure the edges or seams in each sheet with vapor barrier seam tape. Spread the tape from top to bottom, pressing down firmly with the flat or your hand to ensure even coverage. Place your wall studs and insulation over the vapor barrier, then pick up the bottom of the sheet that extends out over the floor, and fold it back up over the bottom edge of the insulation. Nail or staple it into place over the studs. Apply the dry wall or finishing materials to the walls. Check all walls for damage, including cracks and existing moisture. These must be repaired before adding a barrier. Building experts recommend installing vapor barrier in a basement against the foundation walls before placing studs and insulation. Pull the barrier tightly across, and cover large surfaces as flatly as possible. Make sure not to tear or cut the material. Align the barrier right up to electrical outlets, pipes, windows and other obstructions, and use a sealant to secure the material. Install non-faced insulation over the vapor barrier. 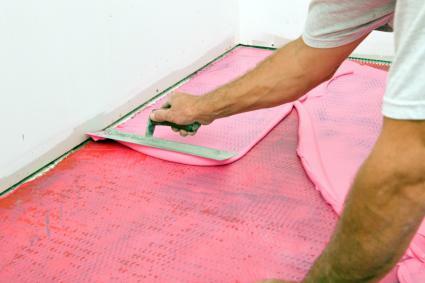 If your insulation has a barrier already attached, or you're installing new insulation over old, make long cuts into it so that you don't create a bubble effect. Moisture could seep in between the barriers, rotting the insulation. With that said, you don't need to install a vapor retardant if your insulation has that protection attached. But remember--the paper barrier side faces the interior, or heated, wall, and the insulation side faces the exterior. Don't manipulate the insulation in any way. It does not have to be fluffed, puffed, or stretched, and doing so could tear any attached barrier. Just unroll it and put it up. 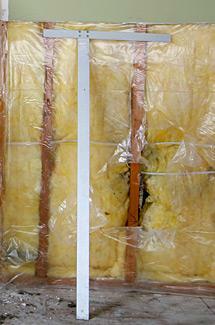 Some forms of rigid insulation serve well as vapor barriers. Check the coding to see if your selection pulls double-duty. Take the necessary precautions when handling insulation. Wear a face mask, eye protection, work gloves, and long sleeves. Depending on the size of the basement, the job should take two people about four hours. Material costs will vary based on square footage and type of material used. Check the building codes in your area to see if you need a permit. Any basement located below ground level is at risk for excessive moisture. Take the steps to protect your finished basement and furnishings by installing a vapor barrier before finish materials go up. You'll be glad you did.